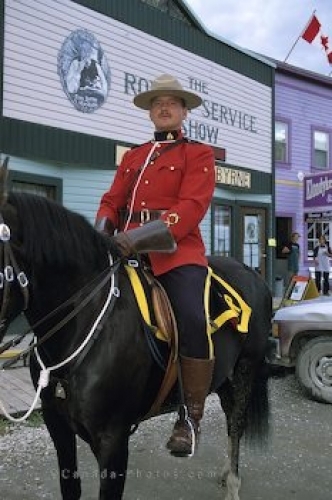 A RCMP Mountie poses for a picture clad in his traditional red uniform riding horseback at the Klondike Gold Rush National Historic Site in Dawson City in the Yukon. Many stories and legends date back to the RCMP in the gold rush era as they played a very important role in the development of the Yukon. Picture of a RCMP Mountie at the Klondike Gold Rush National Historic Site in Dawson City, Yukon.